Recent figures have prompted optimism, but the country still has many issues to address. This summer was a stormy one for the Indian economy. The rupee plummeted 25 percent against the value of the dollar, the industrial and manufacturing sectors continued to underperform, the balance of payments deficit swelled and rocketing inflation hit consumer spending. With India boasting growth figures of 9.3 percent as recently as 2011, many are wondering why the country seems to have stagnated at the 4 percent mark. In September Raghuram Rajan, a respected IMF-trained economist, arrived in a blaze of optimism as the new head of India’s central bank, tasked with putting an end to the economic downward spiral. Judging by recent figures his tough fiscal measures may well have staved off a crisis. Numbers published this week show that India’s growth rate rose to 4.8 percent in the last quarter, up from 4.4 percent in the period April to June. The drastic reduction in the current account deficit – which fell to 1.2 percent of GDP from 4.9 percent in the quarter-before-last – also caught many by surprise. India’s prized service sector, particularly finance, insurance and real state, weathered the summer’s storm and after a good monsoon, both agricultural output and demand picked up. And huge recent purchases of Indian stocks (second only to Japan, in Asia) was treated by many as the long-awaited sign that investor confidence had returned. For P.D. Chidambaram, India’s Finance Minister, these latest figures were proof that the worst had come and gone. On the back of them he made bold forecasts, predicting 6, 7 and 8 percent growth rates in the next three fiscal years. Big predications are an attempt to signal to investors that India is once again a safe bet, and India’s financiers hope to kick-start a benevolent cycle of investment-fuelled growth. But there’s good reason to take this news with a pinch of salt. As The Economist notes, India’s Finance Ministry are notorious for airbrushing figures and with a general election imminent, the ruling Coalition, accused by critics of mishandling India’s once shining economy, will be doing all they can to ride into the next year’s polls on the back of positive numbers. The panic that gripped the country has gone, and been replaced by cautious optimism. But India’s economy is by no means out of trouble. Though the rupee has recovered in value, it is still down 13 percent against the dollar since January. 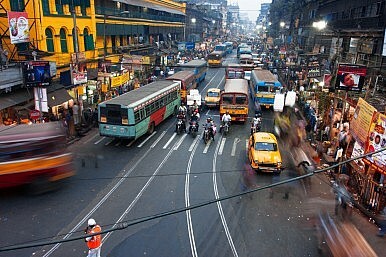 Despite a 0.4 percent increase in growth, the latest figures mark four consecutive quarters of sub 5 percent growth, and whilst 4.8 percent may be impressive when compared to the U.K.’s revised growth figure of 1.4 percent, for example, it is far below the 8 percent India’s government claims it needs to tackle poverty and create jobs. Contrary to the bullishness of India’s Finance Ministry, economists surveyed by Reuters last month insist that the figures on growth will get worse before they get better. Fears of “stagflation” – of static growth and rampant inflation – have stifled entrepreneurial activity and key sectors, such as mining and manufacturing, continue to flounder. As the Confederation of Indian Industry said: “The two drivers of growth this year – good monsoons and exports – are insufficient to pull the economy out of the present slowdown.” Quick fiscal fixes, like an increase in interests rate to tame inflation (currently topping 10 percent) and a ban on the import of gold to equalize the balance of payments, account for a great deal of the recent improvements. But both are unpopular and unsustainable palliatives, which will have to be reversed before long. This long list of downsides doesn’t include the biggest problem, which remains the dubious record of India’s policy elite. In the last fiscal year, investment fell to a decade-low of 1.7 percent of GDP, no doubt a result of the accusations of policy inertia that have dogged India’s ruling coalition. As Asia’s third-largest economy, the Indian market remains an appealing prospect for investors and this is matched by shrill domestic demands for growth. Nomura, the Japanese bank, in a note last week confirmed, “political stability and policy credibility are paramount to corporates making long-term investment decisions.” Uncertainty in an election year is inevitable. But if investors are cautious, it is because they’re waiting for a more accurate diagnosis of the health of India’s economy and for a full “recovery plan,” both of which will only emerge after India’s political fate is decided at the ballot box in May 2014.